Effect: Select 1 monster. As long as this card remains face-up on the field, the selected monster cannot attack or change its battle position except by the effect of a Magic, Trap, or Effect Monster Card. This card inflicts 500 points of Direct Damage to your opponent’s Life Points during each of your Standby Phases. When the selected monster is destroyed or removed from the field, this card is also destroyed. This is basically the Perma-Trap version of the Equip-"Spell" Mask Of The Accursed, but with one major difference, the chosen monster cannot change their position. The few cards that that helps with are Dream Clown and Crass Clown, since if you only had Accursed on them they can still cause field disruption while taking 500 damage per turn. Another good point about this card is the "When the selected monster is destroyed or removed from the field, this card is also destroyed. ", because certain cards like the old Spellbinding Circle which has the same effect but without causing damage, when the chosen monster would be sent back to hand or offered as a tribute then Spellbinding would remain useless on the field taking up space. If need be, you can use Giant Trunade to get back the card if you really need to kill that monster or if you wanted to play Raigeki or Dark Hole without wasting Nightmare Wheel, then reset it and wait for the next victim. 500 Direct Damage may not seem like that much, but if you can keep that monster on the field for several good turns the blood starts to spill. 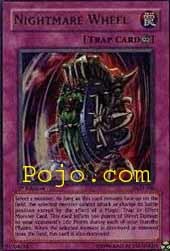 The obvious card to help out would be Mask Of Restrict, stopping the opponent from tributing the chosen monster. The meanest thing you can do with this combo is add in a Lava Golem, but you have to time MoR and Nightmare Wheel right after you summon Lava Golem, thus causing 1500 Direct Damage every turn and they can't tribute or attack with Lava. This card can help speed up the usual Burn Decks, but it can also help out in other decks if you want to bide some time or do some extra damage, but that's also if you can find the room for it. ArtWork: 3.5 - Very mean looking torture machine, it would have be cooler if they threw in like a DMG or a BEWD getting tortured instead of whatever that monster is suppose to be. Select 1 monster. As long as this card remains face-up on the field, the selected monster cannot attack or change its battle position except by the effect of a Magic, Trap, or Effect Monster Card. This card inflicts 500 points of Direct Damage to your opponent’s Life Points during each of your Standby Phases. When the selected monster is destroyed or removed from the field, this card is also destroyed. Nightmare Wheel will cap off this week of card of the days. All I can say is that this card is interesting. As much as I hate to use that term in describing a card, it's the truth. I honestly feel this can actually make it in high caliber competitive tournament play. Beat down won't have full potential use of this, but control, can really give this brotha a home. This is just the kind of card that burn decks can bring home to mother. The effect not only will keep monsters at bay, but will eat away at your opponent's life-points bringing you closer to the win. This is basically a new and improved Spellbinding Circle. I also love the fact you can nail face down cards with this card so they can't activate their effects and just idle while they lose 500 LP a turn. This is what I call a Simply Strategic card. If it tickles your fancy, you can even use this card on your OWN monster so your opponent takes the 500 regardless. Now then, Nightmare Wheel. This is a fun little card, GREAT for Casual play. IMO, its not Solid enough to play tournaments with, unless you can cook up some fun combos with it. Its a Continuous Trap card that when played makes you unable to change the position or attack with a monster of your choice. It then does 500 damage to your opponent for each of your standby phases. Really, I found some interesting/fun things I can do with this card. First I thought about Lava Golem, but that's a little weird. Then I thought about placing it on your own Spirit Reaper. (I dunno about everyone else, but I think Spirit Reaper makes a great Defense. Also, I haven't checked the PDF on this card, so please don't sue wrong rulings..). You get a card that doesn't die by attacks (in DEF mode) and a free 500 against your opponent. Neat little trick. Honestly, this CAN go in burn and stall decks. Stall cards help keep monsters alive, if you put it on your monster. If you keep in on their monster, you can just let them take the 500 each turn. This really is a fun card, I wish the damage was a little more, and had a few more uses.